Where Head meets Heart. This is where the magic of powerfully aligned intention lies. The Intuition Journal Kit is where heart and head come to dance. I created it to help open-hearted seekers, like you, unleash your untamed dreams and bring to life soul aligned action. The Intuition Journal Kit comes with over 30 beautifully designed templates over 70 pages. A personalised cocktail made up of one part planner, one part journal and a lot of heart. Whether it be for chasing that dream, holding space for your intuition, planning out your day or capturing reflections from your meditation practice, each sheet in the Intuition Journal Kit is dedicated to helping you join the dots to your higher purpose. WHO IS THE INTUITION JOURNAL KIT FOR? There is so much we can get from putting pen to paper in our journals. Clarity and insight can come from deeply, reflective journalling and in those moments of stillness. The Intuition Journal Kit has powerful journal prompts along the way to help you connect back into your intuition. Whilst I love the concept of Bullet Journalling and having a beautiful hand drawn template for every page, I know that our time would be so much more valuable, if we spent it building our businesses, chasing our dreams and looking after ourselves instead. With the templates Intuition Journal Kit, you can simply reprint the sheets whenever you need them. I know I don't want to be planning out my day with a traditional To Do list or Daily Planner without checking in with my heart first and asking myself the BIG questions. I wanted a journal with prompts along the way that could help bring my heart and head in closer alignment with each other when creating the plan for the day, week or month ahead. How do you want your day to unfold? What do you want to create for yourself? What are some things that you can do for yourself today? How do you want to feel? What beliefs do you need to let go of in order to progress? These are all questions that will be asked of you along the way in the Intuition Journal Kit so that you are always heading in the direction towards your highest purpose. Beyond planning for our day ahead, there are lots of other purposes that journalling is perfectly suited for. What if you wanted to track your wellness intentions for a month and create a beautiful habit? Or if you wanted to bring to life something you have always dreamed of? 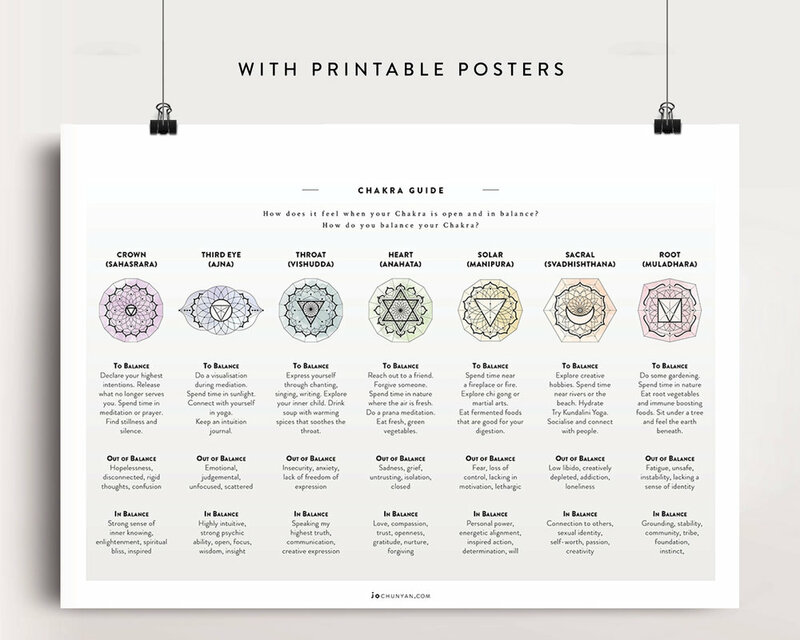 Or perhaps you wanted to capture all your insights from your meditation sessions? Or maybe you want to learn how to nourish yourself with food and plan your meals for the week ahead. 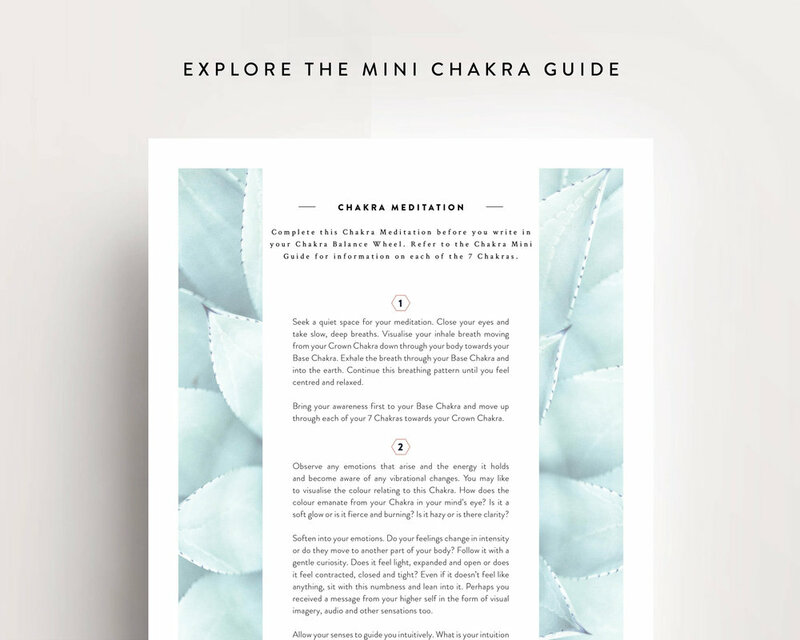 The Intuition Journal Kit includes templates that invites you to explore all areas of your life from meditation, intuition, wellness, rituals and habits, nourishment, self care, goal setting. It is so much more than a planner for your day. If you are saying yes to these points above, then we are likely souls on a similar path! I wanted this kind of journal system that would match the criteria above but couldn't find anything out there that ticked off all the points for me - so I decided to create my own. It’s a bit like a “choose your own adventure” journal. Depending on your lifestyle and your daily intentions, explore the sheets that you feel will help you connect with your essence. You may like to use a few sheets to keep track of a particular intention or move through all the sheets at your pace and soak it all in. The Intuition Journal Kit is dedicated to those moments of stillness where curiosity, insight and creative flow come out to play. 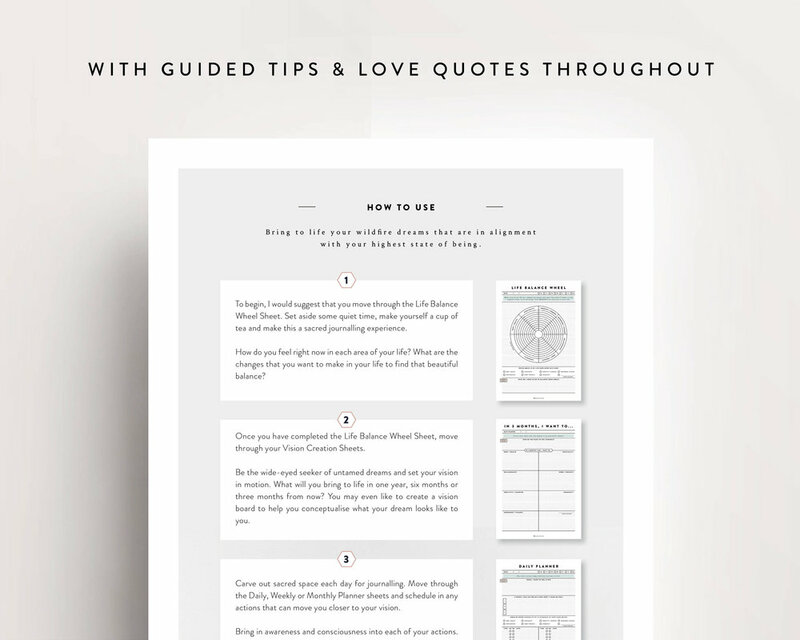 Designed to help you distill insight from your highest wisdom, you will find illuminating journal prompts and soul-nourishing practices to inspire heart-filled action. I would recommend setting only a few intentions (whether it is a big vision or something that you want to track using the Wellness Tracker template). This will keep you focused throughout. There are lots of journalling templates but use only a few at a time to help you stay focused on what it is that you want to create. If you have an iPad Pro and an app like Goodnotes or Notibility, the Intuition Journal Kit works seamlessly. Its a beautiful way to keep everything saved in the same file so you can look back over your days, visions and trackers over time. For those who love putting pen to paper, you could print out the sheets and journal to your heart's delight. I like printing them out two to a page to save ink and paper. See all the beautiful kind words that people are saying about the Intuition Journal Kit and how they have used it! Yes - Print it as many times as you would like. DO YOU OFFER A PHYSICAL JOURNAL TOO? No. This product is only available as an Ebook pdf. The reason for this is because a lot of the journal sheets are reusable. Based on how you enjoy working with the Intuition Journal Kit, you may find that there are some sheets that you will be printing off more than others. It is designed so that you can customise it to how you want to move through your journal. WHAT SIZE DOES THE JOURNAL COME IN? It is designed for A4 paper however you could print it two to a page if you find you have enough writing space. CAN I USE THIS ON MY IPAD PRO? Yes! The Intuition Journal Kit works super well if you have an iPad Pro, Apple Pencil and a Goodnotes or Notability app. I love using it like this as it allows me to take my journal with me wherever I go. CAN YOU MAKE ME A CUSTOMISED JOURNAL SHEET? Yes - this would be part of my Design services. Please contact me at hello@jochunyan.com to request a customised journal sheet. WHAT IF I DON'T WANT ALL THE SHEETS IN THE JOURNAL KIT? The Intuition Journal Kit has been designed to cover various areas of our life and the full Kit comes with over 30 templates over 70 pages. However, if you wanted only one section of the kit, visit my Etsy store here and you can purchase the individual sections. WHAT ABOUT MY EXISTING JOURNAL? You can definitely use your existing journal alongside The Intuition Journal Kit. The Intuition Journal Kit is flexible in that you can choose how you want to incorporate it into your life. Explore and experiment with what makes sense for you and how you would use this kit.